Vinyl is back, and so is the need to keep it clean. Add years of life to your collection and enjoy better-sounding music. 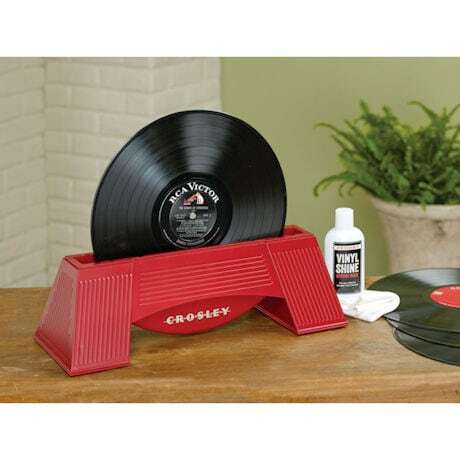 System accommodates 33 1/3, 45, and 78 RPM records, cleaning both sides simultaneously with microfiber brushes and special cleaning solution - enough for several hundred records. Microfiber drying cloths polish records to a dustless shine. 17"w x 5 ½"h x 6"d. Specify Red or Black.